I wish I took a “before” picture, but it was too disheartening. The fingerboard was detached from the neck. The hairs on the bow hung loose. The G string was missing. The bridge wasn’t set. So I drove my mom down to Music Center of Hawai`i to have a luthier give an estimate. The bow had to be replaced, but the fingerboard could be reattached and the bridge remounted. He also wanted to change the pegs. Of course, these kinds of repairs can cross a threshold where it makes more sense to buy a new instrument. My mom was going to fly out to Chicago to spend a few months with the grandkids, and she wanted my niece, who’s studying violin, to play this instrument. The luthier mentioned he really couldn’t tell whether repairing the violin would be worth the effort since it needed the repair to determine its playability. But there wasn’t much of a question about my mom’s choice — she wanted it repaired. We also had to give the luthier a deadline — it was Friday, and I was flying out the following Tuesday. He said he would get it done by Monday. It actually sounded really good. The luthier pretty much told my mom that it wasn’t a heirloom, but the old wood gave it a really nice tone. I almost wanted to steal the violin for myself. 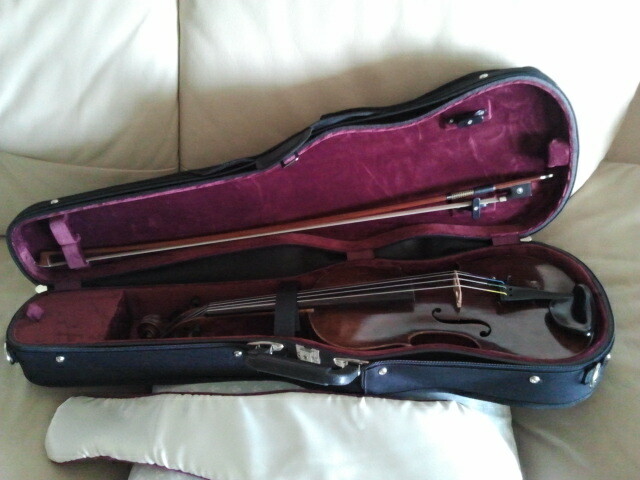 I want to get a better case for my violin now. But it’ll have to wait since I just spent $805 on a guitar and amplifier. As an amateur cellist, I was struck by the teaser for this post on the Holidailies website. As a granddaughter with a broken grandfather clock, facing the choice of figuring out how to fix it myself (fortunately my husband is an engineer) or pay $1200 to have a professional take care of it, this post was even more poignant. Your niece is a very lucky young woman.